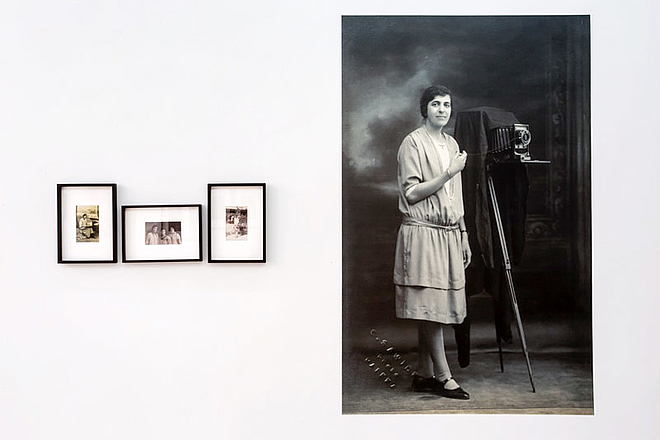 Darat al Funun presents the first comprehensive exhibition of photographs by Karimeh Abbud, the first Palestinian and the first Arab woman photographer to set up her own studio in early 20th century Palestine. The prints shown are from researcher Ahmad Mrowat’s collection, which only came to light in 2006. Unarchived and not always dated, the collection includes not just images taken by Karimeh Abbud, but also photographs from her family album, some of those albums themselves, letters, and her camera. Her portraits and social landscapes form an important historical record of life in Palestine in the early 1920s and 1930s. The exhibition also includes a short documentary film on Karimeh’s life and work by Mahasen Nasser-Eldin. Born in Bethlehem in 1893, "Karimeh Abbud stands out as a different kind of photographer in Palestine. Not only was she the first woman professional photographer, but she was also among the first in the region to set aside European style traditions in portrait art and photography. It is thanks to her portraits that viewers catch a glimpse of a different aura in her photographs. This would be the aura of normality, of people appearing at their best, but within a middle-class context. Their best reflects their dreams and aspirations and in their case, they are the aspirations to be normal. They are neither dignified rulers, generals, pashas and religious clerics, nor do they resemble biblical scene or the ethnographic obsessions of the European viewers. It is thanks to the work of this pioneering woman photographer that faces of the Palestinians before their catastrophe of 1948 show their kindness, their simplicity and their tranquility."